1 of 1 Heat 1 tbsp vegetable oil in a large nonstick skillet over medium-high heat. Crumble in chicken or turkey sausages and cook, breaking apart with a silicone spatula, 3 minutes. Add baby spinach and cook 2 minutes, until wilted. Place 4 fajita-size flour tortillas on a large baking sheet. Shred pepper Jack cheese and top each tortilla with 1/4 cup of the shredded cheese. 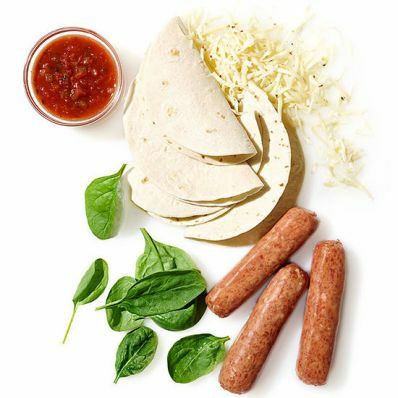 Divide sausage mixture among tortillas and top each with another 1/4 cup cheese. Stack with 4 more tortillas and spritz with nonstick cooking spray. Broil 3 inches from heat for 1 minute. Flip over and spray tortillas again. Broil 1 additional minute. Serve with salsa on the side.